Over 500 people attended the Tompkins County Workers’ Center and Midstate Central Labor Council’s 33rd Annual Labor Day Picnic @ Ithaca’s Stewart Park on Monday, September 5th. 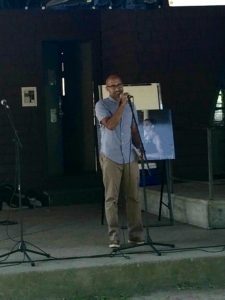 The Picnic organizers focused on the theme: Labor Rights are Civil Rights highlighting the ‘Black Lives Matter’ movement locally. The Guest Speaker was Professor Russell Rickford of Cornell University,and also a leader in the Black Lives Matter Ithaca movement. Incredible music was provided by Colleen Kattau and Mike Brant (Gringa Grooves from the Heart), as well as Ithaca-based rap artist, Sammus also a leader in the Black Lives Matter Ithaca movement. The Communication Workers of America, Local 1111 based in Elmira, NY (responsible for the area including Tompkins County) for their leadership in the recent and successful ‘strike’ against Verizon that saw tangible gains made for both present Verizon workers, as well as opening up new possibilities for organizing workers in non-organized call centers and cell phone stores. 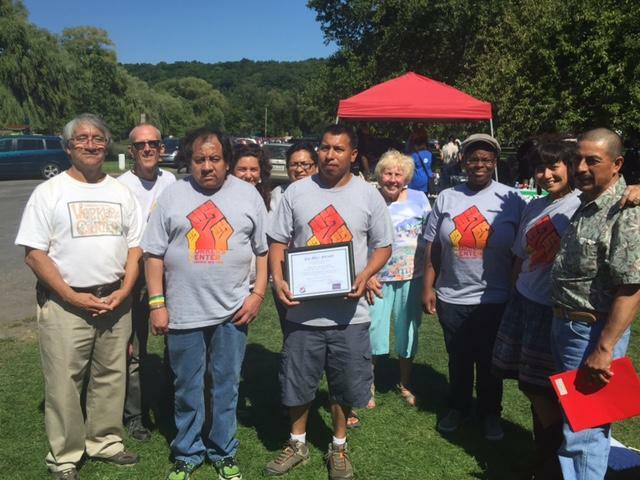 Members of the Worker Justice Center of NY and the Workers’ Center of Central NY alongside Members of the Tompkins Workers’ Center and the Midstate Council on Occupational Safety and Health after receiving the Joe Hill Award. The Full-Time Contingent Faculty at Ithaca College, for quickly organizing a union of their own, following the lead in 2015 of the Ithaca College Part-Time Contingent Faculty doing the same in 2015. 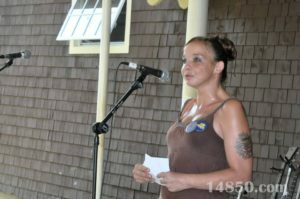 The Friend of Labor Award was given posthumously to a member of the Tompkins Workers’ Center’s Minimum Wage as Living Wage Organizing Committee, Paula Burke, who passed away in late June of 2016 at the age of 36. Paula was instrumental in our campaign and worked tirelessly to ensure that EVERYONE who worked in Tompkins County was paid a Living Wage (which is presently $14.34/hour). Cayuga Medical Center who clashed with nurses earlier this year over the nurses’ right to form a union amid claims that under-staffing was leading to safety issues. The second “Goat” award went to Syracuse based Hayner-Hoyt construction, who engaged in conduct designed to exploit contracting opportunities reserved for service-disabled veterans.